After few weeks of jostling, Selangor has finally put together a team to govern the state. 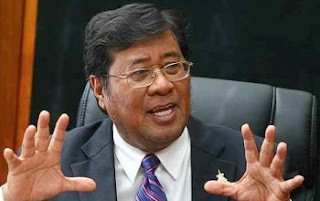 The selection of Tan Sri Khalid Ibrahim as Menteri Besar was a difficult manouvre on it's own. If there is truth that Tuanku Sultan put his foot in the selection, it was a wise intervention. If not, there are some wise and realistic people in the leadership of Pakatan Rakyat. This could send some blood boiling among pro-BN readers and some MCE 3rd graders among them to suspect Anwar Ibrahim had bought us. An unschooled remark is best responded with a stupid response. Actually, we had a tryst with Anwar at the most unlikely place to suspect.... Tivoli Villa. 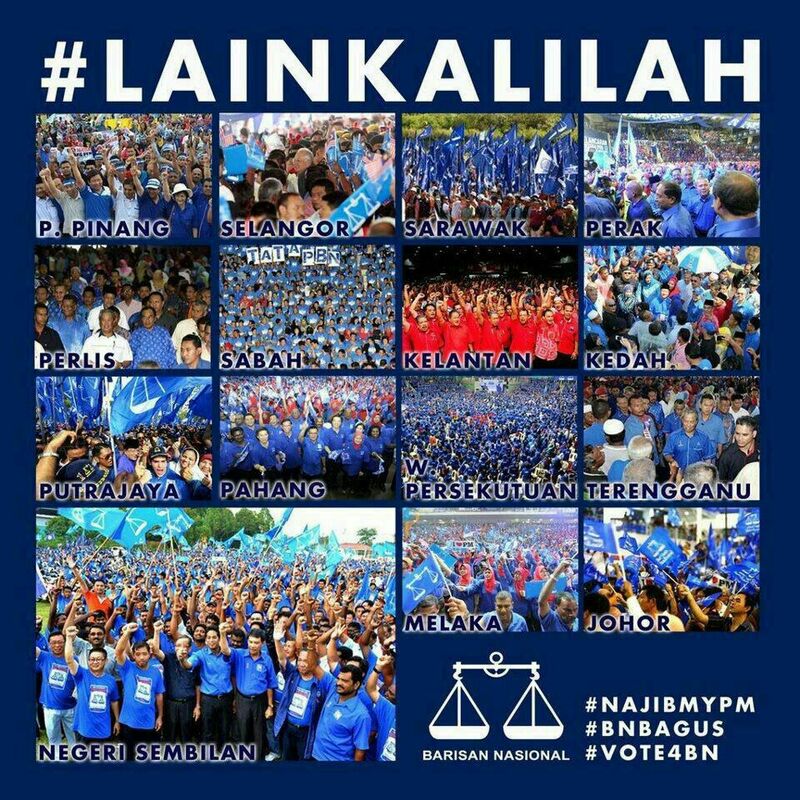 "BN's strength lies in the rural areas. Yet too much time and money were wasted in urban areas where the results were almost certain." KUALA LUMPUR: Barisan Nasional (BN) used the wrong strategy in the 13th general election, said former Finance Minister Tun Daim Zainuddin, and as a result was a blow to the coalition in spite of its victory. Tun Daim made his remarks in an interview with China Press. An English translation of the interview was shared by blogger and veteran journalist A Kadir Jasin. In the interview, Tun Daim answered questions about the results, the cause of BN's poor showing relative to 2008, the so-called "Chinese tsunami", and whether Prime Minister Mohd Najib Tun Abdul Razak is a "lame duck" prime minister. Is this what the Chinese want? On May 7th post GE-13, Utusan Malaysia journalist, Zulkiflee Abu Bakar wrote a piece in response to the May 6th silent walk. 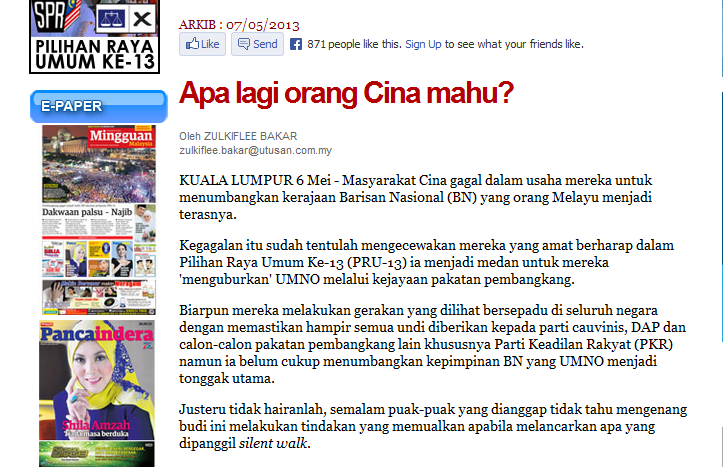 The direct but simple and innocent question he posed was "Apa lagi Cina mahu?" [read it here]. DAP won 38 seats out of the 51 seats contested in Parliament. PKR and PAS managed to salvage some seat out of some split in the Malay votes, particularly from the urban and youth voters (save for Kelantan), and courtesy of Chinese votes. It is the best performance by DAP and Chinese voters basically gave political dominance to DAP in Pakatan Rakyat. Zulkiflee felt the Chinese want more power. Despite the concession given by Dato Najib, which is brewing a backlash from Malay educationist, economic practitioners, and community at large, Chinese refused to give BN even the minimal of votes. His view may have it's own merit. Some bloggers felt the Chinese had betrayed by being deceptive during campaign. They are retaliating with a call to Buy Chinese Last campaign. Those aware of the reverse discrimination on the common Malays employee and businesses maybe taken to act in such adversarial manner. Definitely, this not the way to build a nation. But, is this what the Chinese want and willing to risk? Did "too many generals spoil the battle"? Or were the generals suitable for today's political warfare? When Prime Minister, Churchill visited his Cabinet Room in May 1940, he declared: 'This is the room from which I will direct the war'. Barisan Nasional introduced the concept of war room to direct and monitor it's political campaign in the recent general election. One can expect the room is filled with people, computers and information on candidates, contested seats, opposition, campaign message and issues, news, polls, projections, etc. for the generals to work out campaign strategy/ies. 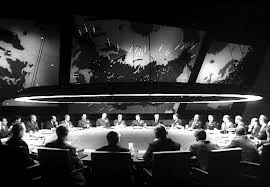 However, did the war room helped make BN's political battle as strategically organised, disciplined and dedicated, and precise like any military campaign? Pak Lah's bad luck has still not dissipated. That is one quote we wish to share from the many calls we received to comment on UMNO and BN's less than satisfactory general election results. Since his resignation, we do not wish to dabble in him. He is a fallen leader, thus no need to humiliate him further. We responded to say, "Janganlah begitu. (Don't be like that). The past is the past." And explained, "Do you know that I sat together with Pak Lah and Pakya Moron to chat before solat jenazah arwah Man Janggut at a Masjid in Taman Melati? And, on several occassions, I approached him in public to shake hand... orang tua. Kesian people ignore him." The caller responded, "But you did not kiss his hand ..."
"Ooo .. please don't push your luck. I don't simply kiss anyone's hands." That call came in because of Khairy's remark to offer himself to be in cabinet and blah blah blah ... which is nothing more other than a politician's word that is filled with caveats. This boy really has no shame. In the last cabinet appointment, we made a posting on an intended staff appointment by a senior member of the cabinet. While it changed his decision and our concern was genuine and sincere, we faced his personal displeasure for butting-in in an area that is to quote him, "my prerogative." The cabinet appointment is Prime Minister Dato Najib Tun Abdul Razak's prerogative but we are ready to face his displeasure for butting-in. If he failed to put in place a proper team with the integrity, credibility, and capability, he will only put Barisan Nasional on the path of the inevitable demise for the 14th General Election . 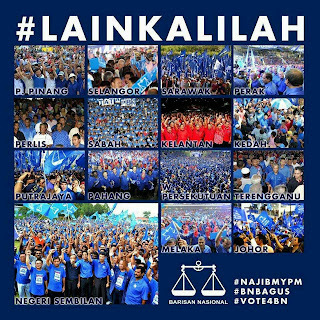 With Barisan Nasional's performance in the recent 13th General Election is far from satisfactory and did not put the coalition out of the wood, every step counts. The cabinet appointment is very important in many aspect. UMNO to bungkus in GE14? Still angry, tired and fed-up. Currently out of town and still reluctant to return. Not because we lost. No ... BN is still in power. We managed to takeover Kedah, though not as much as we expected, but we still win it. And Mukhriz is new Menteri Besar. We manage to defend Perak. BN was trailing but towards the end, Bagan Serai seats and Selama came in favourably. In a neck to neck race, never ignore the marginal voters. But we are pissed with the fact that we failed to takeover Selangor and Kelantan because of our own mistake, power greed, and foolishness. Juan Mata struck an 87th-minute winner as Chelsea won 1-0 at champions Manchester United on Sunday to reclaim third place in the English Premier League and tighten their grip on a Champions League spot. It was a lacklustre game by United at Old Trafford as they were drifting towards a goalless draw. But, Mata collected a pass from Oscar and dispatched a low shot that took a deflection off Phil Jones on its way into the bottom-right corner. Mata's goal means Chelsea go into Wednesday's crunch clash against Tottenham at Stamford Bridge with a three-point lead over their London rivals, who are bidding to crash into the top four. Dato Seri Anwar Ibrahim had mentioned in his speech during the Himpunan Kebangkit Rakyat Bangit or HKR 112 on that there will be a street riot when there is electoral fraud. Thus far, although there is no need to do so, the Election Commission had submitted to Bersih's 8 point requests. All of it including the archaic practise of indelible ink to avoid duplicate voting by unscrupulous operators. It is viewed as archaic in view of the tight issuance of identity card, existing procedures, and existense of other security technology available. People do not trust the ability of Pakatan Rakat to administerexisting states under them. They have failed to do so well. Still they insist there is fraud. We've been traversing the country for the last two months and more so during the election period. This general election, our focus is on home state Johor and in particular, Gelang Patah. Must have made three trips to Gelang Patah and few to Muar and Batu Pahat. Pakatan Rakyat can continue to play their mind games on the voters and violence and threats on Barisan Nasional supporters, but they are losing and trailing. Gelang Patah will be Dato Ghani for the take. Forget the statistics and number crunching. 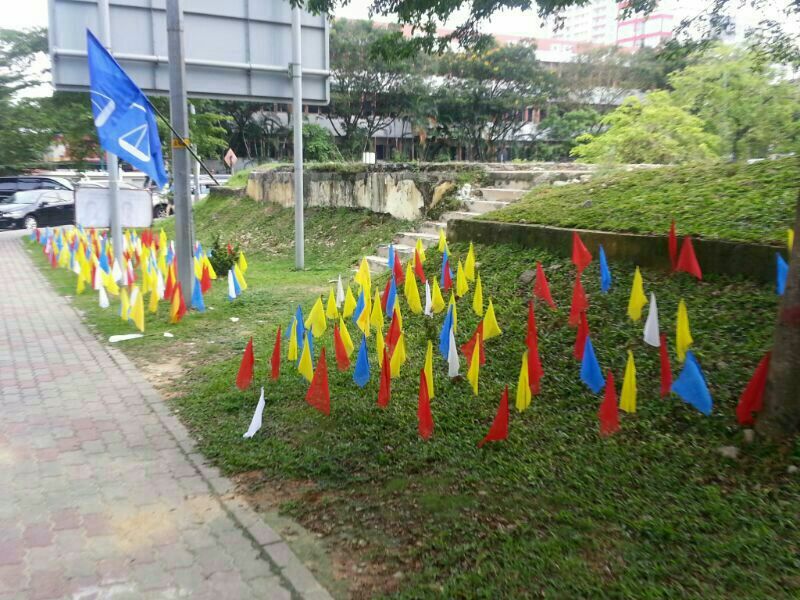 The tell tales signs are all over for a victorious Barisan Nasional. We are feeling two third is not impossible. For Pakatan, don't blame it on Election Commission. That is what Bersih wants to. But blame it on themselves. 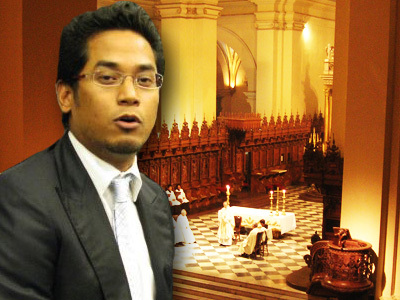 One of our informer said Lim Kit Siang had confided with uncle Lobert, Tan Sri Robert Phang. He cursed at his wrong move by swearing at Ghani Othman. If it had been Jason Teoh, he would have made mince meat out of him. But with Gelang Patah at 52-53% Chinese, it is a 50:50 seat Kit Siang is not accustomed too. Gelang Patah is a huge area, slightly smaller than Singapore. Again, Uncle Kit is not used to. All his past constituencies are urban and smaller in size... very manageable. Despite having Dato Zaid Ibrahim as "adviser" and Salahuddin Ayub as running mate for ADUN Nusajaya, the Malay votes is not within reach of Kit Siang. Heard he had to face hostile crowd when campaigning to the Malays and also Chinese. Indian is also beyond reach after the Kg Buah Pala Penang incident. Najib hs got the support of Hindraf and Waytha Moorthy campaigned for Najib and Ghani. Kit Siang knows Ghani can reach to the Chinese but he insist on playing the favourite role and Ghani comfortable at being underdog. Kit Siang strategy is to create the wave of big Chinese crowd at Sutera Mall and Skudai. The crowd maybe be huge in the 7-10,000 but only the front and supporters are exuberant The rest are wait and see. Majority of the attendee are curious outsiders. 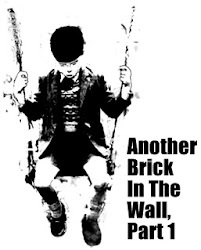 Ghani did not entertain Kit Siang's brickbat but choose to play it soft, the Johore Way he claims. He could have played the good cop, bad cop campaign but he did not. Underdog Italy can beat a ferocious attacking Brazil. Ghani is the understated favourite. 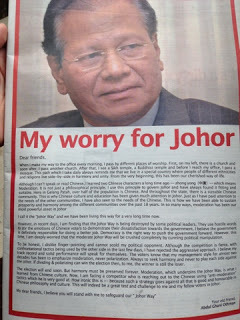 Kit Siang failed to see the Jason Teoh factor. 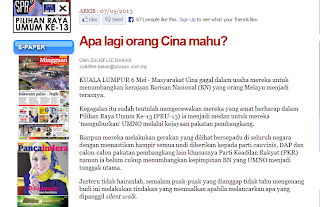 He thought the 20,000 newly registered voters in which it is about 70% is Chinese and 30% Malay. And, he didn't understand thoroughly why Dr Boo Cheng Hau is strong in Skudai. All for his cocky, arrogant and to'kong son. In our own asessment without giving up any details and numbers, BN is heading for two third majority. Sabah, Sarawak, Johor despite DAP's attempt, Pahang, and Melaka are fixed deposits. There could be some threat on Negeri Sembilan from DAP and Terengganu from PAS but it will be BN to keep. Winds of change is loud in Kelantan and Kedah and do not be surprise to see both fall. Kelantan people are fed-up with inefficiency of PAS administration. The same in Kedah but in fighting is the real problem. There is some in fighting in UMNO as usual in the two state in famous for cah keting, but contained. Perlis is not a problem. Our prediction for Perak is for two third of the state assembly is BN. Do not be surprise that the Ngeh Ng brothers will be jobless. For Penang, be ready for some surprise results Unless MCA and Gerakan can carry their own, Penang will still be with DAP. Who knnows miracle happen. Pakatan is trying to play a mind game and blame it on EC. Then they hope to start a revolution and topple the government by force. 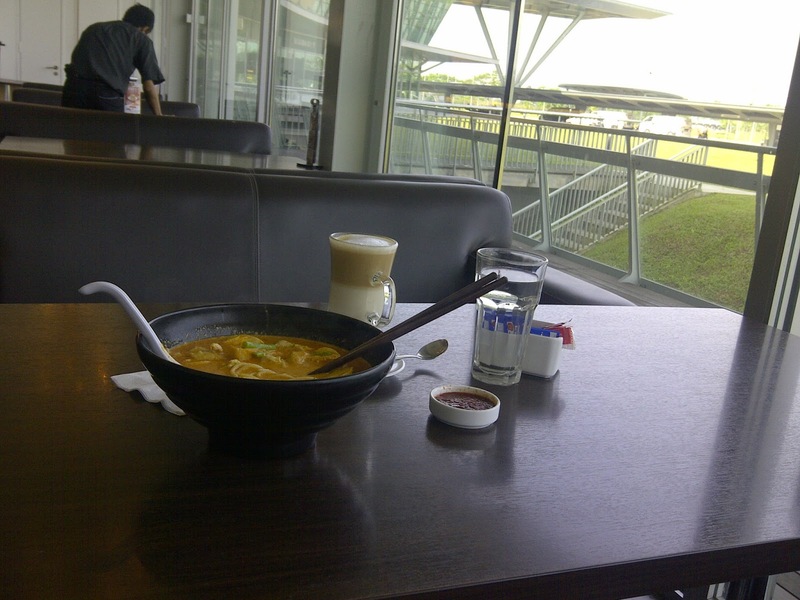 One needs an empty stomach. Malaysia has too high level of obesity among it's population to have a revolution. If he has to blame anyone, it has to be himself. He is not a saleable product for PM. Neither are Kit Siang or Hadi. Definately not Lim Guan Eng. Party or candidate as a product needs a good track record. Pakatan has none to show but only spin and use of propaganda to tell the public their are good. The acknowledgement is not from the public and all work of life. The blame BN of this and that but they themselves did it. How do they expect voters will give them a chance? True, they are great propagandist and with their psywar. But campaigning is not merely of that. It is not just black op and psywar. Mind game is not forever. Over time, the truth will surface and it will set them free from their dreams of Putrajaya. Political campaign needs a good and honest selling and proper image. BN has ownership on good image, attracting the crowd and spirited in a positive way. Pakatan screwed it up with their militancy. And they will lose. 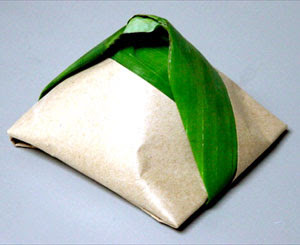 "Kelantanese have lost faith in PAS in many aspects. For example, the case of 'Kalimah Allah', a pondok ustaz told me that Pas had committed the biggest kemungkaran (disavowal) of aqidah (faith). When I asked him what it was, he said it was when Pas proclaimed that Pas is Islam and Islam is Pas. After 23 years, they feel that it is time for a change." "The (Pas held) Kedah government was dysfunctional. 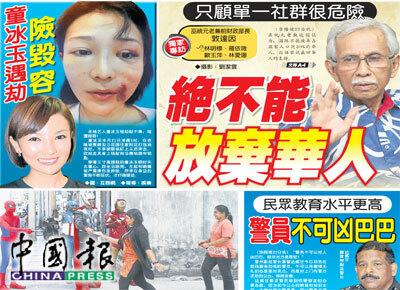 The menteri besar and several of his exco members were disunited and were openly squabbling with each others. " "In Selangor, they have been disappointed by empty promises made in 2008. In many areas, it is clear that they felt cheated when pledges made then were not kept." On Pas vs Islam, PM said, "Pas has not defended the issue of aqidah (faith), This is a major reason why their traditional staunch supporters, pondok school teachers, and many ustaz had lost their trust in the party. "To them, Pas has damaged the aqidah of Muslims. They view this seriously." So, Pakatan Rakyat ...in case they did not realise, Ini Kali Lah is not good slogan. In Arabic, it resembles the meaning "I'm Allah". It is the boastful word of Dajjal when it surfaces on this earth. The involvement to help out in various campaign work must have taken the time that it is difficult to allocate time to update this blog. Somehow or rather, updating this blog became the lowest priority. We've been doing a lot of traveling around the country, particularly to Gelang Patah. At Senai Airport, Johore Baru one morning and over breakfast that we realised the opposition is singing the same and popular tune on the issues of tol, petrol and automobile. These issues have been answered by many but this time we like to lend a hand also. The reasons we too like to take a crack is because it is Rafizi, the compulsive and everytime caught lying Strategic Director of PKR doing the delivery. It has to be understood well because it is a complex issue made simple and can be dangerously convincing to simpleton voters.